Samsung launched the Galaxy Note 4 smartphone just over a month ago and it has only just made it into some retailers but we are already hearing rumours about the specifications of its successor. This particular rumour concerns the specifications of the Samsung Galaxy Note 5’s display panel. A new report on PhoneArena has been published, following an insider tip, that says Samsung is preparing to mass produce a 5.9-inch Ultra HD Super AMOLED display panel around August next year. Ultra UD is the same as 4K people and the expected pixel resolution is, as tech watchers would expect, 2160 x 3840 pixels. 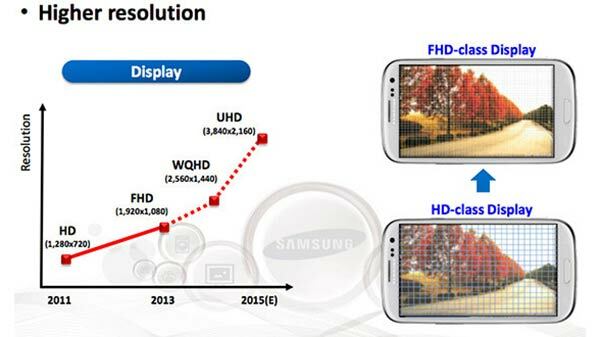 On a 5.9-inch screen this would present the viewer with a display of nearly 750ppi! The timing of the mass production of the screen falls perfectly for the launch of the Samsung Galaxy Note 5. As many Samsung phablet fans will know the South Korean tech giant always launches the new Note smartphone at the IFA show in Germany. That takes place annually in early September. So the first units will start to roll off the production line around that time and into shops in the months shortly after the reveal. Phone Arena backs up its insider info with an official roadmap, published by Samsung previously, which showed that it would be aiming at UHD screens on mobiles by 2015. Furthermore we hear that fierce screen-making rivals at LG and Sharp also have their sights set on producing UHD sub-6-inch displays in the coming months. Do you want 4K in your pocket? Do you feel that your HD, Full HD or Quad HD smartphone screen isn’t quite sharp enough – or is this race for the highest ppi just madness? I note that the Sony Z3, the Japanese firm’s top of the range smartphone, didn’t go for the highest ppi screen possible as it was both unnecessary and detrimental to battery life and processing speeds.